When Jonathan Grossman joined Gift of Life’s registry during his gap year in Israel, he already knew about the lifesaving power of marrow transplants – his friend’s brother had survived leukemia thanks to a marrow donor. Although Jonathan was too young to join the registry when that friend needed help, he jumped at the chance to become a potential donor when Gift of Life presented the opportunity. Four years passed without being a match, and Jonathan felt it was unlikely that he’d ever have the chance to donate. But in February 2016, Gift of Life called him with exciting news: he was the match for a 49-year-old woman suffering from leukemia. “I assumed that someone in that dire situation would be looking for a small ray of hope, and just that hope alone could make a world of difference,” said Jonathan. Cori Sudderth, a resident of Metairie, La., had just been diagnosed two months earlier. As a neonatal intensive care nurse, she knew that unexplained bruises and shortness of breath should be checked, but she was shocked when her doctor told her that Acute Lymphoblastic Leukemia was the cause. Neither her brother nor her parents could donate to her, but fortunately Jonathan was quickly found in Gift of Life’s registry. Jonathan donated peripheral blood stem cells in May, 2016, and once Cori received her transplant, her recovery was underway. Many weeks can pass as the recipient’s new immune system develops, so Cori’s daughter took a semester off of college to be with her, and her husband took care of their son and home while still working full time. 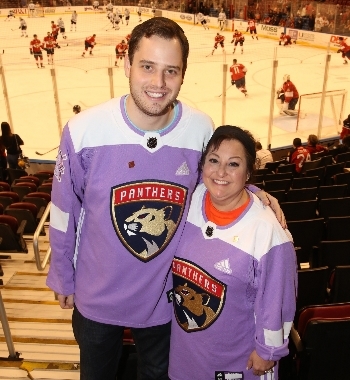 Regulations protect the identities of donor and recipient for the first year after transplant, so both of them were incredibly excited when Gift of Life and the Florida Panthers invited them to South Florida to be introduced to each other during Hockey Fights Cancer month in November 2017. Their emotional meeting took place at a private suite in the BB&T Center, home of the Panthers. “You look so healthy and good, I’m so happy,” Jonathan told Cori as they shared a big hug, then Cori’s daughter and husband joined in the embrace and thanked him for saving her life. Not wanting to miss out on the fun, Stanley C. Panther, the team’s mascot, leaped into action and hugged everyone as well. Jonathan, Cori and her family attended the hockey game, and were recognized on the stadium’s Jumbotron as the Panthers invited people to join the marrow registry. 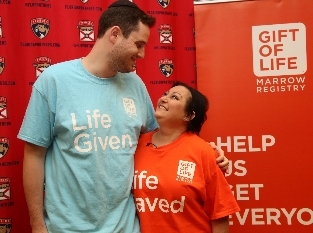 Gift of Life thanks the Florida Panthers for their ongoing support and for helping raise awareness of the hope that bone marrow transplantation offers to those suffering from blood cancers. Watch the video of Jonathan and Cori meeting for the first time. To join Gift of Life as a potential donor, order your free registration kit. In the summer of 2010, Cheryl was working at Camp Moshava in Honesdale, PA, when she came upon a Gift of Life donor drive and decided to swab her cheek.